AV Audio Editor is a new and easy-to-use audio editing program. It will help you to cut, paste, mix, merge and perform almost editing actions to various kinds of audio files. Do you want your audio project will be one of a kind masterpiece? Today, we will show you a small tip to enhance the audio and make your own music remix to be more surprising, more personal and absolutely more special. 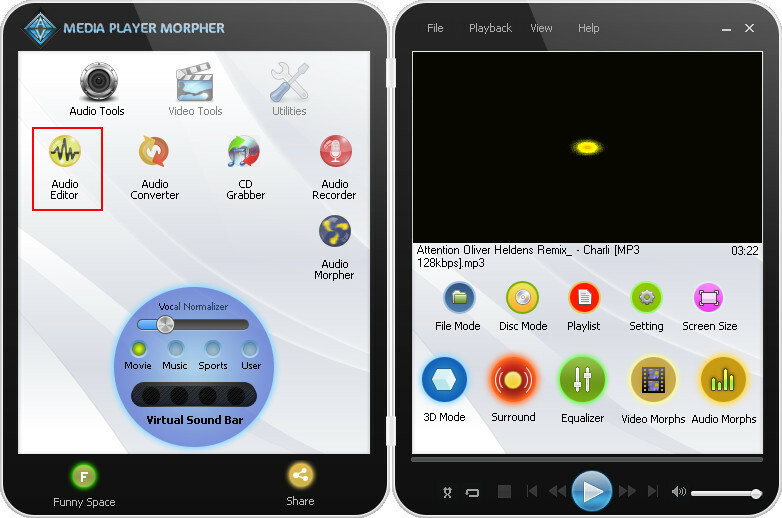 » Download Media Player Morpher for the complete audio and video tool selections. - Launch Media Player Morpher » Select Audio Tools icon on the left panel » Choose Audio Editor to open the tool. - Choose New Multitrack Session…. - And then, we recommend using Default settings for the Sample rate and Channels of the session. - You will see a few Tracks in the session. Right click on a track and choose Insert >> File… to open your audio files. Each track will represent one audio file. - You can also right click anywhere and choose Add New Track From File… if you want to add more files (There are 4 Tracks at Default). - You will see the added audio tracks (1). - Select a track to open its own track section, and then select the part you want to add effects (2). - Choose the effect you want from the Effects Library (3). - Adjust settings for that effect (each effect will have a Settings window) >> Click Apply (4). Note: Power button will allow you to preview the effect. - Click Undo if you want to use the other effects (5). After completing your remix, select Save File as… button to save your audio file. Note: You can save the file under many formats such as: MP3, WAV, WMA, FLAC, OGG, RAW, WV, etc.